Follow the blog and our social media profiles (Twitter, Facebook, LinkedIn) all week for updates on New Profit's 11th Annual Gathering of Leaders, which kicks off on Wednesday. The event brings together top social innovators and their counterparts in business, government, philanthropy, media, technology and academia to build dialogue and collaboration around the toughest social challenges we face in America. The Gathering exemplifies New Profit's deep commitment to cross-sector collaboration as the only real path towards systemic change in education, early childhood development, economic empowerment and public health. Good collaboration, as our partners from Deloitte wrote recently in the Chronicle of Philanthropy, depends on open exchange of ideas, which is why Gathering participants are encouraged to challenge each other’s beliefs and assumptions, forge new connections, spark ideas, align strategies and shape new initiatives. But collaboration is nothing without action, and the Gathering has been a place over the last decade where high-impact ideas are acted upon and advanced. The photo above is of David Gergen, an advisor to four U.S. Presidents, challenging participants at the 2006 event to do more to advocate for innovative policies that drive resources to programs that get better results for people in need. Out of that moment, America Forward, our policy arm, was born. Since 2008, America Forward has become a coalition of 60+ organizations and a leading force in the movement for performance-driven policy and programs. More than $1 billion in public resources have been mobilized for innovative approaches like Pay For Success, which was catapulted forward by the America Forward-supported Workforce Innovation and Opportunity Act of 2014. What does it mean to be on a path to opportunity in the U.S. today? Do the systems, strategies and organizations we’re creating, with the intention of increasing access to opportunity, express sufficiently acute insights into what it will really take to succeed? What are we learning about the ways that race and class wind through these pathways from people who have cracked the code themselves? How is technology closing—and widening—gaps? Gathering participants will be asked to join dialogue about these questions and talk about how they can play a part in shaping the answers. A group of 10 leaders will be presenting "Big Bets" to provoke people to think bigger and better about what can be achieved. See below for a list of bet makers and stay tuned for more information! 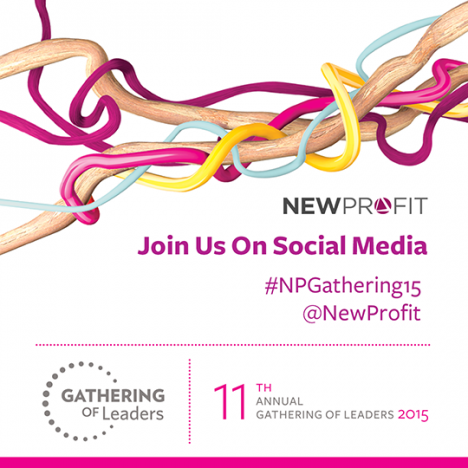 We'd like to offer heartfelt thanks to our lead sponsors for this year's event - Bromley Charitable Trust, Knight Foundation, Henry McCance - and our supporting sponsors the Kresge Foundation and ebay inc.
Use the hashtag #NPGathering15 if you'd like to join the conversation this week. To read about the themes of last year's Gathering, check out our colleague Kim Syman's "7 Reasons for Social Innovation Optimism" series in Fast Company.